Do you remember the Eureka Stamps - Large Christmas Angel I shared a couple weeks ago? 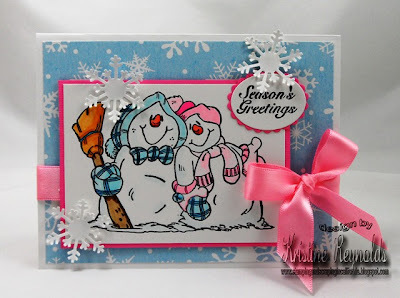 Well I am here again today to share a quick and easy card using this beauty. Image colored with Copic markers and fussy cut and pop dotted. I had this fun wide glitter ribbon that seemed to work on the backgrounf. I added a few sporadic gems to add more bling. There are several versions of this Angel with different items in her hands available at Eureka Stamps. Hi there. 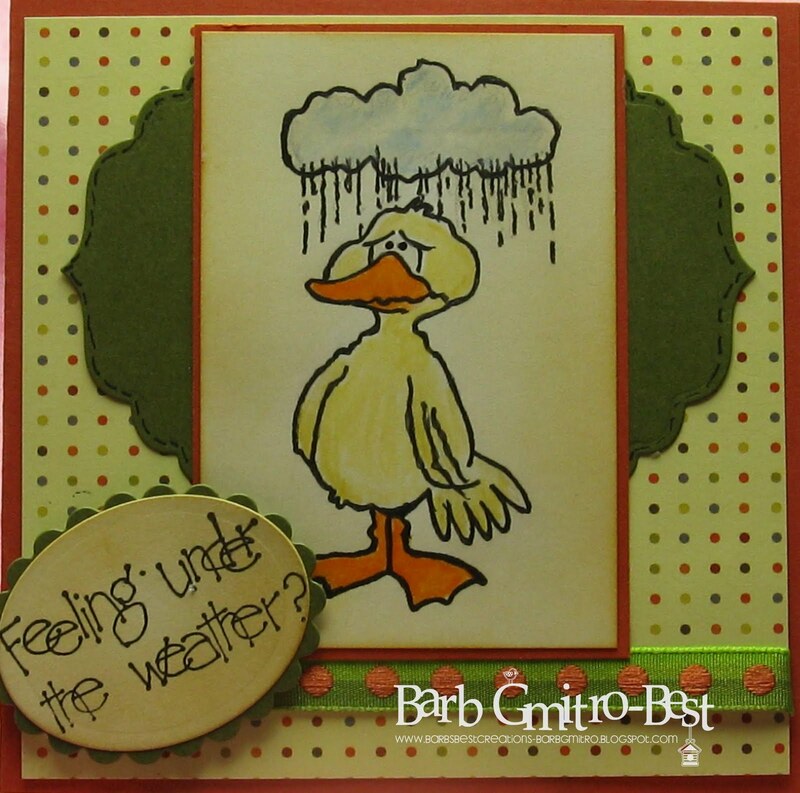 Today I wanted to share a card I made using one of the sentiments from QKR Stampede as a focal point. I don't usually do that...since I have this thing for images being the focal point...lol, but I really liked this one. Here is what I did. I started by stamping the Your Birthday image on some yellow CS. I trimmed it down, and layered a little off centered on the PP from Echo Park. Then I stamped the little Cupcake image 4 times and colored them all a little different. I fussy cut them out, and used a pop dot to mount them onto some little flowers. Last, I put a flower in each one of the corners of the card. I thought this would be a cute card for one of my DD's to use for an upcoming birthday party. We got 2 different invites for 2 different parties on the same day at 2 totally different places...AHHHHH...where is the Harry Potter time turner when you need it. LOL Anyway, thanks so much for stopping by. Have a fantastic day! I must say I am thrilled to have gotten so many Christmas cards done this month. 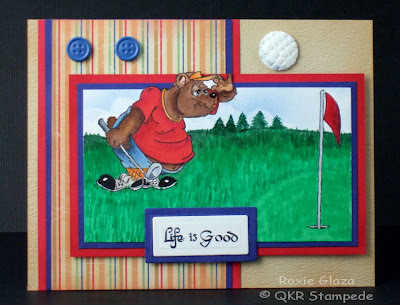 QKR Stampede is one of the original companies I started with and I really enjoy the Rubber Stamps. The quality is wonderful- I also like that I get to mount myself just in case I want to do something different with them. Today I have a simple but elegant design to share. I have two views of the same card to share so you can see the details. Maya Angelou is an amazing woman with so much insight, I think she is wonderful. Below is one quote from her and I think it is quite appropriate to go along with the card I am showing you today. I wanted to end my July posts with one more Christmas in July post. Hopefully, you have gotten some great inspiration and ideas from our blogs this month and have gotten started on those Christmas cards and projects. I love this image called "Skunk and Lights" (#10901) from Eureka! Stamps. 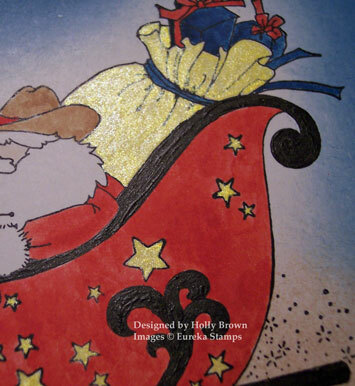 The "Merry Christmas" sentiment is from QKR Stampede, one of the sister companies of Eureka! This image is great to use on cards that you want to make a lot of, as most of the image is 'colored' for you already. 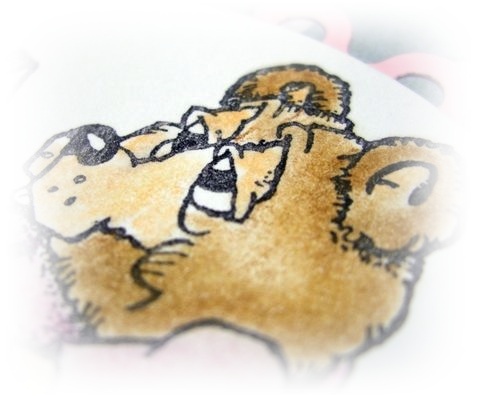 Once the "Skunk and Lights" is stamped all you need to color is the lights and they are quick and easy. The sentiment was printed from my computer. "Merry Christmas" comes as a rubber stamp and also as a digi, which is what I used. I don't use a lot of digital stamps, but I do love that I can size this sentiment to whatever size I need to fit my card. 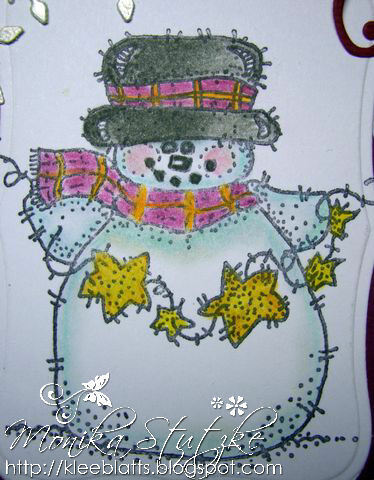 I used "Christmas Border" (#15706) also from QKR Stampede, on the inside of the card. Biblical Impressions, the other of the 3 sister companies, and see what they have to offer. All three stores have some amazing images. Be sure to click on the tabs at the top of the page and see what all three design teams have to show you. Hiya, folks! 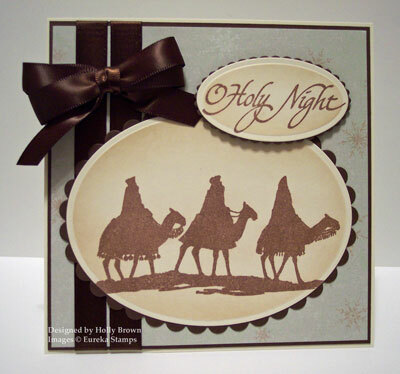 It's Holly posting, and for my project today, I used the Three Wise Men stamp and the O Holy Night sentiment stamp. I stamped both with brown ink and then cut them with some oval dies. 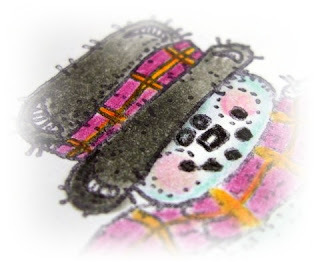 While they were still inside the dies, I sponged some Antique Linen ink around the edges. Some dark chocolate satin ribbon on the left side and some pale blue patterned paper is all I needed to add to this Christmas card. Birthday cards you can never have enough. I have made another card with the cute teddy bear ​​of QKR Stampede. 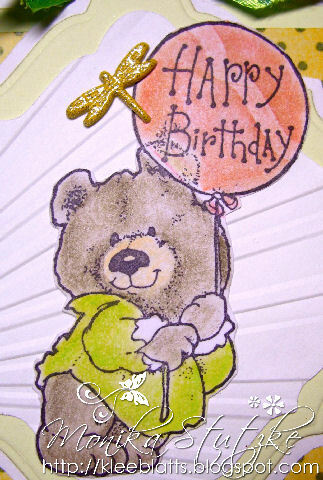 It's the "Birthday Bear" and I can only say again that I love the little guy. 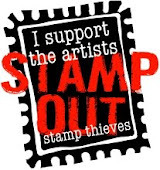 This stamp you can also buy rubber stamps or as digistamp. So I guess I was in a mood for fall themed cards this week. 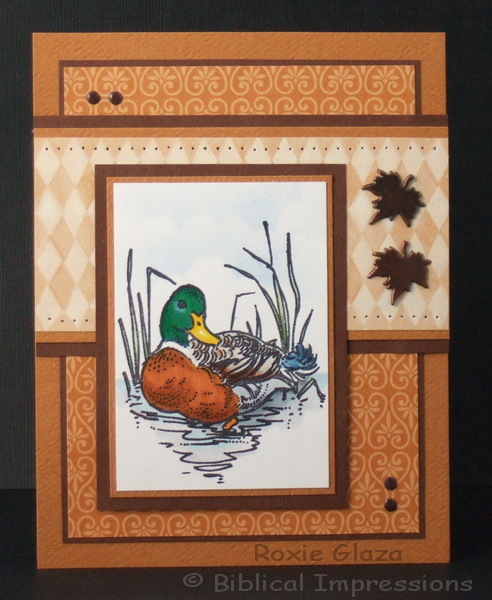 I posted a fall themed card on my blog on Saturday, and now this one. Although this one is more fall colors then theme. Check it out... This little girl image is from Biblical Impressions, and is called Picking Dandelions. Isn't she so sweet? As a mom of 3 little girls, this really reminded me of my girls. They always run to grab the "puffy" flowers and blow them off. I started by stamping the image onto the white CS, and again on the polka dotted PP. Then I paper pieced the dress and bonnet onto the main image. I colored the rest with markers. I cut into an oval, and cut another PP oval to layer that onto. I layered onto a piece of orange PP next, and then added the yellowish ribbon. For the "bow", I cut a piece of ribbon, and folded the ends under to give it a "loop". Then I added the flower and brad to the center of that. A sweet fall colored card! Thanks for stopping by! 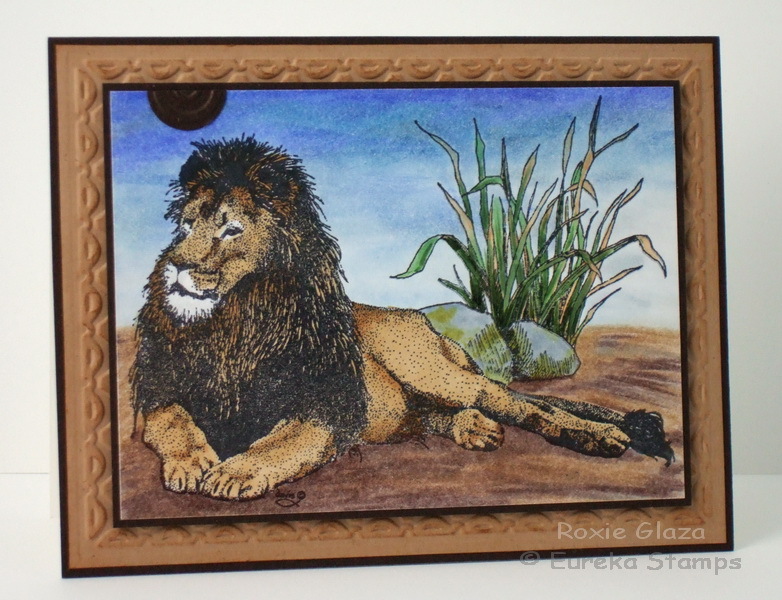 Its Roxie here today showing you another wonderful wildlife image for the guys or any animal lover that you can find in the Eureka collection – 13001 Lion and paired up with the 1407 Rock with Tall Grass image. The lion image was stamped first, masked off using a sticky note to stamp on the grass. The ground and sky were colored with Prismacolor pencils: ground area - dark and light umber, cool grey 50%, French grey – 50%, sky – indigo blue, true blue, violet blue, ultramarine. The lower sky was colored with what was left on the paper stump from the darker portion with just a touch up here and there. 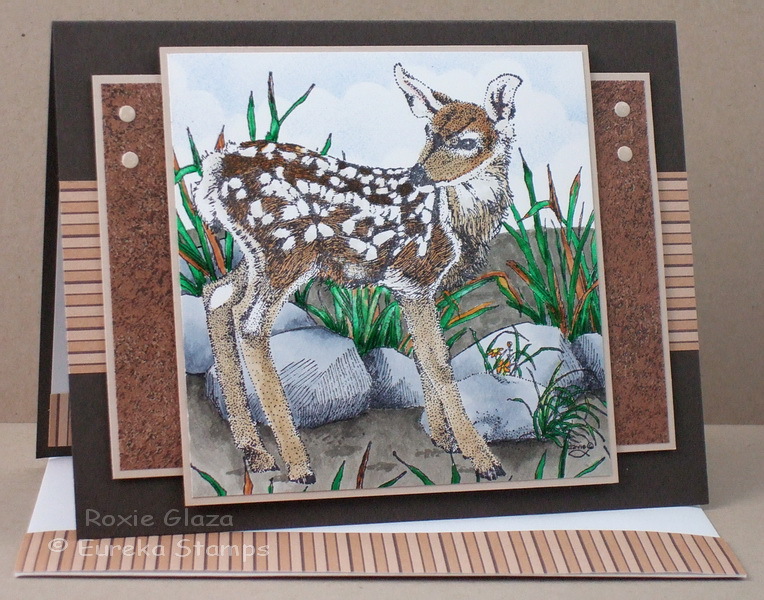 The embossing on the tan panel was created with a Stampin Up tulip border folder and ink Distressed using Ranger Distress ink – Tea Dye. The brown half circle tab was embossed with the Cuttlebug folder Spots and Dots and glued to the card with Aleene’s tacky glue. The image panel and brown border are popped up with foam pop dots. So Happy for the weekend! We are going to pick up my son from camp today. He's been gone for two weeks so I am really looking forward to seeing him. It's been pretty hot lately so I thought I'd cool down mentally by playing with some snow!!! I really like how this color combo turned out. 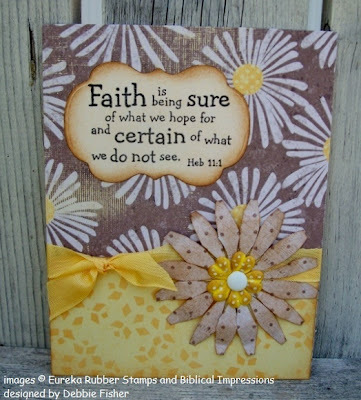 With the designer papers and an easy to color image from Biblical Impressions, this makes a real quick card to create. I used the Tim Holtz ruler Bazzill piercer for piercing the diamond panel and I find it helpful to use repositional tape to hold it on the paper…and lots of it! If you look close on the lower left of the image you’ll see that two pieces didn’t do much good…good thing I could cover most of it up because it looks bad. The faux brads are cut with the Cuttlebug die Tiny Tags because it rounds the edges. I glued them to the card with Aleene’s tacky glue and then squeezed on Paper Glaze to form a nice bead and when it dries it falls flatter and looks like the real thing to me and they sure mail easy! My son in law is an avid golfer so this is the perfect image for him from QKR Stampede! The edges are ink distressed using Ranger Distress Ink: tea dye on the base, fired brick on the red and designer paper, faded jeans on the blue. The trees in the background are freehand using the brush stroke method. 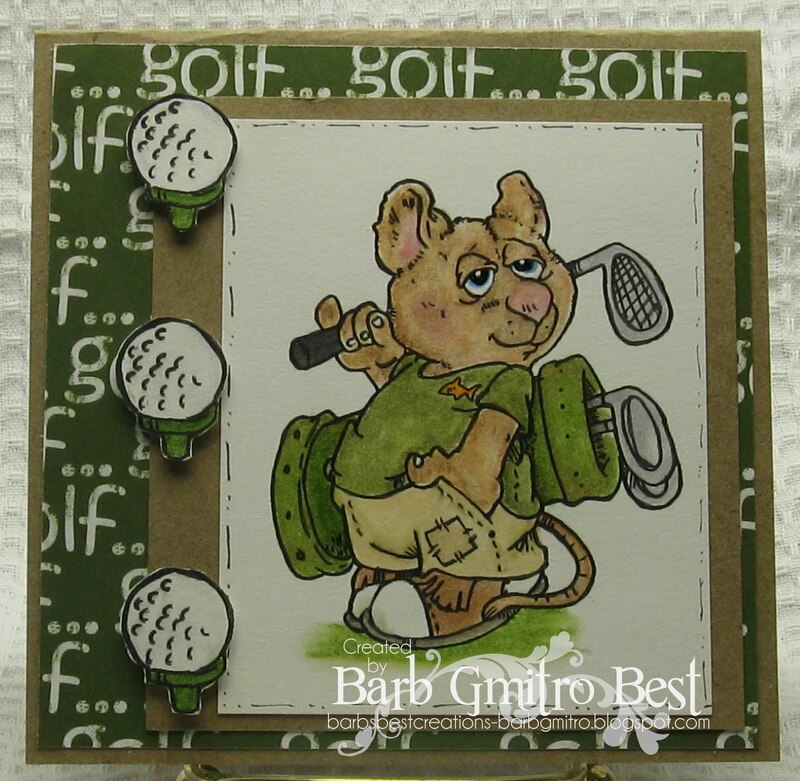 The golf ball was cute with a ½” punch, embossed with Cuttlebug and Mesh folder, embossed on the back using a metal ball stylus and shaded with a C1 Copic marker. It’s mounted to the card on a foam pop dot. This title is so fitting for my Eureka Stamps card this week. Maribeth has the Three companies: QKR Stampede, Biblical Impressions, and Eureka Stamps .Each company has a variety of great images. This Large Christmas Angel is just such a beauty to color. I knew I had to use a mixture of soft colors and textures.Image colored with Copic markers,fluffy fiber from my stash. Paper from HL.Tag and flowers from my stash. The sentiment A New Song is from QKR Stampede. I am still working on Christmas cards...and having fun with all the great stamps available from Eureka Stamps. We've been having quite a hot spell in our area. I love the heat, but this is getting to be a bit much. Hope you are staying comfortable where you are﻿. 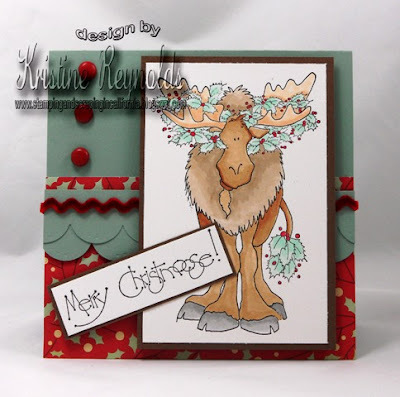 Today I have a card to show you that I'm calling "Christmas or Not"
I made it using 2 images from QKR Stampede. 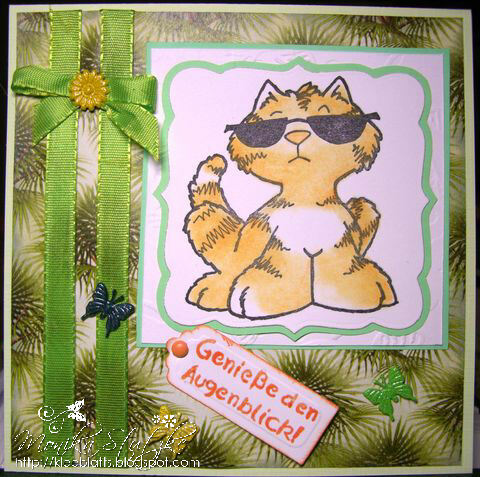 First I used "Tree" (#14501) I inked the stamp, stamped it on a scrap paper and then stamped onto the green vellum. I did this several times to make the 'forest' Then I stamped onto green card stock, colored the trunk of the tree with brown and fussy cut it. This was adhered to the card with foam tape. 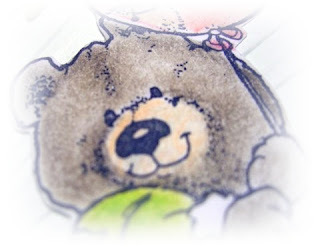 Next I stamped "Bear Hugs" (#15007) onto water color paper and colored them with watercolor crayons. I fussy cut them and adhered them with a double layer of foam tape. I intended this to be a Christmas card to go with the "Christmas in July" theme we have been having this month. Once I got it finished and mounted on the red card base, I realized it could be used for something other than Christmas. So you decide, Christmas or not? Thanks for stopping by today. Leave a comment and let me know what you think. Christmas or Not? that is the question. This poor duck certainly is! This cute stamp is from Eureka! stamps. Under the weather is from Eureka also - # 2007(424). Todays card features two QKR stamps. colored pencils blended with mineral spirits. This card today is a Biblical Impressions stamp that I think will be used often. 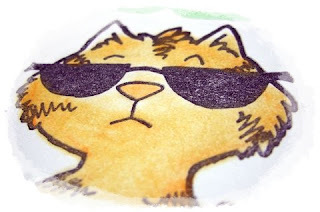 I found this two sided paper from CTMH worked well with the stamp colors I used. How often does that happen? I used a circle Spellbinder to cut the shape out of the middle- and just cut lines across the circle to fold back in a star pattern. This is a picture of the inside of the card-isn't that a nice simple image to use? 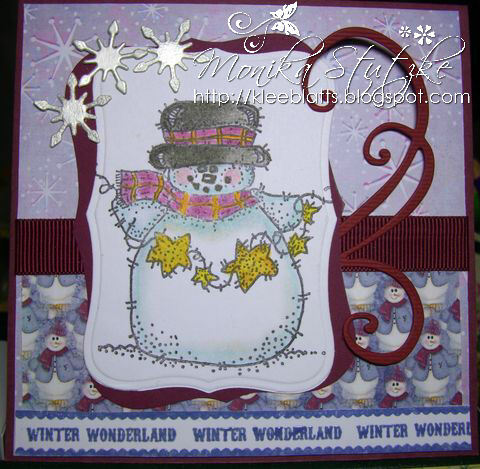 The Noel sentiment is from Eureka Stamps. My Biblical Impressions post today using a verse stamp Faith Is and a 3-D stamp set from Eureka Rubber Stamps called Daisy Pattern. Ho ho ho!!!!! Yup, you read that right - Rein-dillos!!!! Santa doesn't have reindeer in Texas because it's just too darn hot for those reindeer. 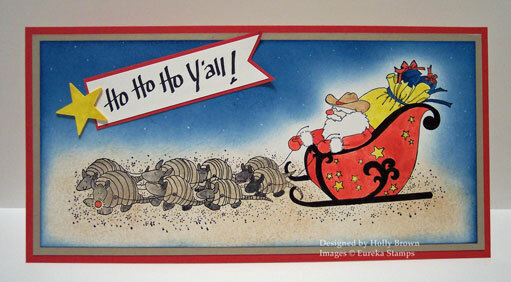 Ever resourceful, Santa loads up his special armadillos when he gets to the Texas border. Hee hee hee!!! Hi there. Today I wanted to share a card I made using this photo as my inspiration... ...and the Pansy 3-D/pattern stamp from Eureka Stamps. So cool huh??!!! I just love these 3-D stamps from Eureka stamps. They are really very easy to use, and add so much to a project. Ok...first I need to tell you about my photo above. We have a garden in front of our bay window. Each year, I plant inpatients in there, and we have bulbs in the early spring. Well this year, I switched up my flower of choice for the garden. No impatients. I bought some other things...BUT...right in the front row under the peach tree, popped up this little plant. A pansy plant! I was soooo excited since I love pansies, but I was very confused where it came from...lol. I never planted these in that spot. We now call it the "random pansies". Funny thing...there is another "random pansy" plant on the side of the house growing in a rock bed! Well, I used my "random pansies" as my inspiration to make these 3-D pansies. I started by stamping the image onto white CS with purple ink. Next, I colored all the pieces with colored pencils. I used a purple pencil to go over the "dark part" of the pansy. Next, I cut out all the pieces, and began scoring and curling as the directions say to. When you make your own 3-D pansy, I recommend that you lay out the pieces exactly as the picture shows. It is easier to grab the correct number petal as the directions call for them. I also find with any of the 3-D images, they "curl" better if you use one squirt of a mini-mister bottle on it before playing with it. Well, after I got these guys together, I attached them to a simple green CS base, and added a rub-on. I really wanted to make the flowers the focal point of this card, so I didn't use any PP or other embellishments. 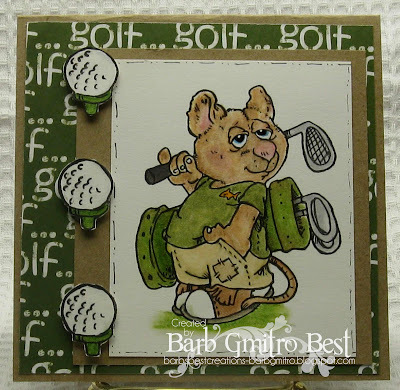 I am going to play with this stamp again and see what other pansy creations I can come up with. 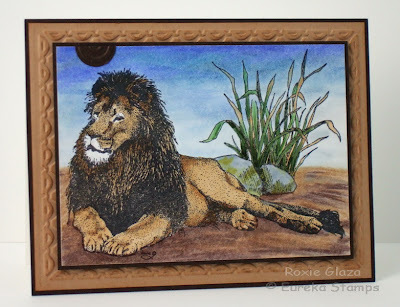 If you haven't had a chance to check out the 3-D/Pattern images from Eureka Stamps yet, be sure to do it today! 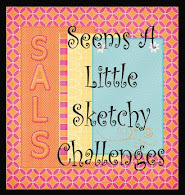 There are so many to choose from, and they add so much to your projects! Tell me, is this a summer? In Germany is this not so. With all the rain I'll soon get webbed toes. I will show once again a Christmas card. The image is "Snow Star" and I like it. It's so fun to stamp Christmas cards when it's hot and muggy outside! Yesterday I made a christmascard for the Blog Hop by QKR-Stampede and now a card for summer. It is alls possible with the fantastic stamps from the 3 shops Eureka! Stamps, QKR Stampede and Biblical Impressions. 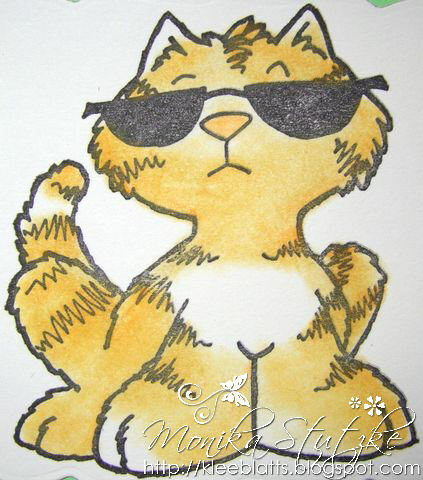 My stamp today is the "Cool cat with shades". The german words "Genieße den Augenblick" are translate in english "Enjoy the moment". This cat is hot, really? Well here we are again- this time we are back with a QKR Stampede Christmas Blog Hop. Have you been getting some great ideas for Christmas cards this year? The official start time is Friday July 1st 6:00AM- so please be patient if all the links are not working yet. This month we have a great surprise! 1 winner will be chosen from comments left at one team members blog during the hop. 1 winner will be chosen for joining and leaving a comment on face book. Each winner will receive 1 free stamp of their choice from Biblical Impression. The ladies have been hard at work- we hope to give you some inspiration for those Holiday cards today. Our line up is listed below- if you find yourself lost during the hop all you need to do is pop back here and check out the list. Now don't forget to leave comments everywhere you hop- that is more chances to win. Now off you go to JESSICA'S blog- I know you will love what she is sharing today. Isn't this the sweetest little Fawn ever! This image has such nice detail and it is so quick to color. The image is from Eureka Stampes. I stamped the Fawn image and masked off using a sticky note, one rock/boulder is part of the fawn image, the rock with tall grass is a separate image. The clouds were sponged on using my handmade acetate template. The faux brads were cut with a Cuttlebug die named Tiny Tags because I like how it rounds the edges. Aleene’s tacky glue was used to attach them to the card and Aleene’s Paper Glaze was then applied to give a shiny finish. The brown designer paper with border was popped up by layering thick carpet tape from the dollar store, someone gave it to me and its useless for attaching layers because of the thickness but found a way to put it to use. The image layer with border was also attached using to the same tape which touches the brown paper, not the base. Well in just a few short days I will be sending my oldest DD off to camp. The hardest part is I can't mail her anything, since it may not make it in time. So...instead...me, my hubby, my mom, my dad, and my in-laws write letters that get packing into each day's clothes. So they end up getting a letter from home each day. HOWEVER, they can mail us letters, so I decided to make both my girls some "Camp Notes" to mail home. My middle DD goes off the last week of July, so I just got them all done at once. Today I wanted to share what I made. This first set if for my oldest DD. She is headed off for 2 weeks of ropes courses, zip lines, rock wall climbing, and more extreme sports. 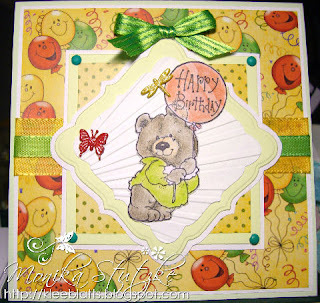 For her cards, I used the Cowboy Owl stamp from QKR Stampede. Yes, I did NOT color the images. I did that on purpose...lol. I thought it would be fun for her to personalize each card before she sends them. They are very simple, but cute. I hand wrote the "Howdy from camp!" on each one with a gel pen. Here is the set for my middle DD. Guess what kind of camp she is going to? Yup...horse lovers week. Since the kids are all younger, they are mostly spending the week teaching the kids about horses, and how to care for them. They are supposed to go for a ride at least one of the days too. She is just ecstatic about the whole thing. Like the other set, I left the image uncolored so she could color them herself. She did tell me yesterday that she will color them all like her favorite horse at camp. The image is called Mare and Foal also from QKR Stampede. I hand wrote the sentiment on these also. I can't wait to get one of each of these cards in the mail!!!! Well that is all for now. Be sure to stop back tomorrow for the QKR Stampede Christmas in July Blog Hop! 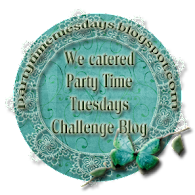 The fun starts right here on this blog at 6am EST! QKR Stampede has some really simple stamps that just work for me. Praying Boy is one of them I knew I wanted to color. I just pulled some lined design paper to use as a background. Some fun colored glue dots from my friend Stef accent the corners. Hope you are checking out all the hops this month at our main QKR Stampede blog. There are several ways to win a free stamp from all three of the companies. I love summer! It's my favorite season of the year. I have a tag to show you today. Each pattern/3-D stamp comes with directions on how to use these stamps and make your 3-D piece. I simply stamped the image onto card stock, shaded it a bit with some chalks, cut it out, scored it, used a little bit of glue to put it together and that was it. Easy peasy! For the tag, I used blue Distress Inks, applied with foam pad applicators. I used a Mini Mister to give it a little spritz of water. This gives it a little bit of texture and more of a 'watery' look. The 'sand' at the bottom of the tag was done by tearing strips of kraft card stock, distressing them with my fingernail and layering them on top of one another. 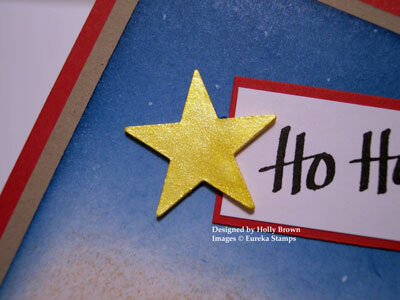 Tags are great to use on scrapbook layouts, on gifts or just as a little greeting to someone. Thanks for stopping by today. Feel free to leave a comment and become a follower. I'd love to hear what you think. And hop on over to the Eureka! Stamps site and check out those pattern/3-D stamps, they really are pretty cool. Sorry. Time passes so quickly and suddenly, the past two weeks and my blog post is overdue. 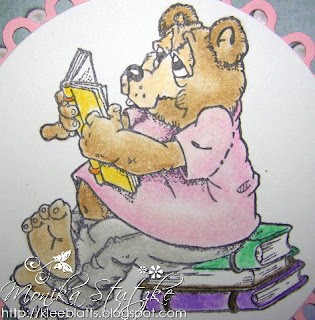 Today I again chose the image "Book Bear", which I think is totally cute. 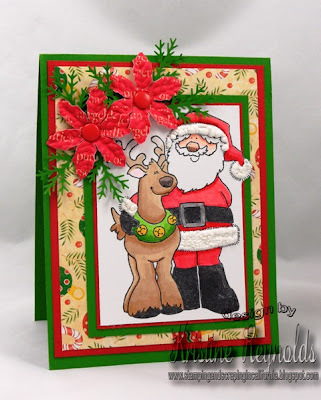 Eureka Stamps Christmas in July Blog Hop!!! !